Welcome to Flight Following! We will periodically publish Flight Following on our website and also send it directly via email in order to make sending and receiving it as convenient as possible for everyone. This journal is intended for volunteer pilots, group leaders, other volunteers, professional staff, and all those interested in the incredible world of public benefit flying! Feel free to pass it along to others. We hope it provides useful information making it easier for those who use aviation in public service do a better and more enjoyable job of flying to help others! 'The Air Care Alliance promotes, supports, and represents public benefit flying through communication and cooperation among organizations facilitating flights for health, compassion, and community service." Cast Your Votes by May 31, 2010! 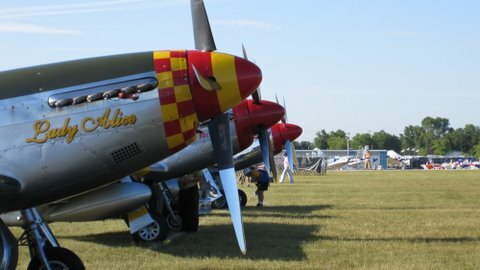 The National Aeronautic Association and the Air Care Alliance are accepting nominations for the 2010 Public Benefit Flying Awards until May 31. Honorees will receive their awards at a special ceremony at the United States Capitol in September! Your Public Benefit Flying Organization can enjoy the following benefits and more!" Join now for just $100 per year! Email Sandy for more information on membership in ACA. Legal Update: The FAA granteth...and the FAA taketh away. A recent decision from the FAA is bad news for volunteer pilot organizations seeking to provide pilots with reimbursement for fuel and other flight expenses. Ironically, the news comes in the form of a GRANT of a Petition for Exemption to allow such reimbursements. Last June, Mercy Medical Airlift (MMA) and affiliates submitted a Petition for Exemption from FAR 61.113, which the FAA has long interpreted to preclude any such reimbursement. MMA cited its recent upgrade in minimum pilot qualifications (which include 500 hours and an instrument rating) and new safety management system as offering an equivalent level of safely to justify the exemption. Aircraft must have 100-hour inspections. It is unlikely that any volunteer pilot organizations, as we know them, are capable of complying with the FAA's requirements. A pilot's costs to meet the requirements may well exceed the anticipated reimbursement. The result is that the FAA granted an exemption with conditions that essentially preclude it ever being employed. In the process, the FAA effectively dispelled any notion that there might be some wiggle room in the FAR's to assist volunteer pilots with the expenses of flight. Might one assume that the FAA knew all of this and fully intended this result? SEE WHO ALREADY FLIES WITH US! Dozens and dozens of groups serve our communities and those in need, including international, national, regional, and statewide groups - and even small local groups with just a few pilots serving their immediate area. 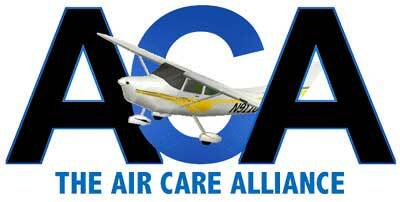 www.aircareall.org/listings.htm please send us your information so we can include you! ...and more to come forward! A PC-12 loaded out for a run. 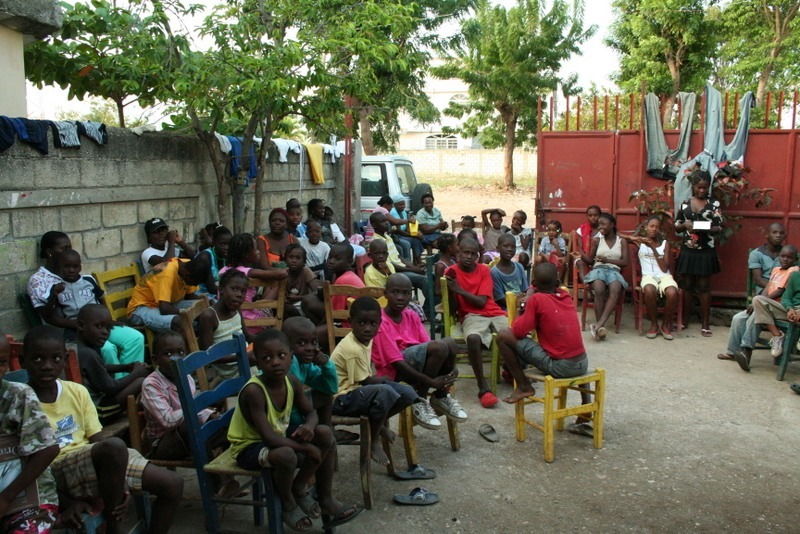 Children at the Art Creating Foundation for Children in Jacmel. Throughout the history of aviation pilots have always been willing to pitch in during emergencies. Whether a pilot flew someone injured in an accident to a hospital, or joined a group formed to facilitate charitable flights, the aviation community has always risen to the occasion. As World War II approached the Civil Air Patrol was organized, and eventually attracted tens of thousands of volunteers to patrol for enemy submarines, conduct search and rescue, and help out following disasters. Local groups such as Sheriff's Aero Squadrons also involved volunteer pilots in search and other missions. In the late 70's and 80's members of groups like LifeLine Pilots and the various Angel Flight groups began to regularly fly patients for care. These were followed by groups facilitating other special missions, such as LightHawk for environmental flights, and EAA Young Eagles for introductory flights for youth. In 1989 individual pilots organized an ad hoc airlift after the Loma Prieta earthquake in California, involving hundreds of flights carrying food, water, and supplies to those in need in the Santa Cruz area. Following Hurricanes Andrew and Hugo some of the patient transport groups pitched in, and this grew in the aftermath of the 911 attacks, when pilots from volunteer pilot groups took to the air that very night, ferrying blood test kits to New York City. Hurricane Katrina, devastating so many people, motivated many volunteer pilot organizations and hundreds of pilots to help. And now the Haiti earthquake has brought a new dimension to the desire of pilots to help: the difficulties of international flight and more complex coordination with relief agencies and the countries involved. The missions accomplished in Haiti are exemplary - those who helped inspire all of us to think of how we could be of help too. Perhaps we would like to fly a mission, or work for our group to help coordinate the pilots with the needs of organizations trying to provide relief. But a problem remains: too often the efforts are organized after the disaster strikes. Individual pilots want to help, but don't know where to turn. The major aviation associations scramble to collect and disseminate information. And the different pilot groups often work independently, too often unaware of what the other groups are doing, or unable to share information and maximize efficiency and safety of flight. Fortunately individuals with groups such as C.A.R.E. 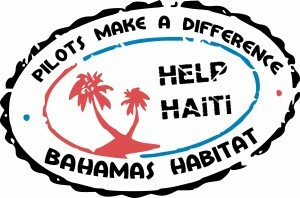 and Bahamas Habitat jumped in and worked to coordinate appeals for transportation with groups and individuals who wanted to help. And dedicated on-site volunteers worked at FBO's in Florida and in Haiti and the Dominican Republic, providing invaluable help and guidance to the pilots and relief agencies arriving every day. It is time we all, as leaders in Public Benefit Flying, take a moment and think about what we have learned in these situations, and develop better, and better coordinated, plans for responding to emergencies in the future. The result will be more aid and less waste, and more effective relief for those in need. 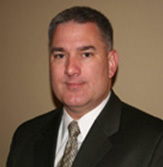 I am really looking forward to seeing everyone at the Air Care 2010 Conference in Reno next month. Remember to book your hotel by March 31st! Scroll down for all the conference details! 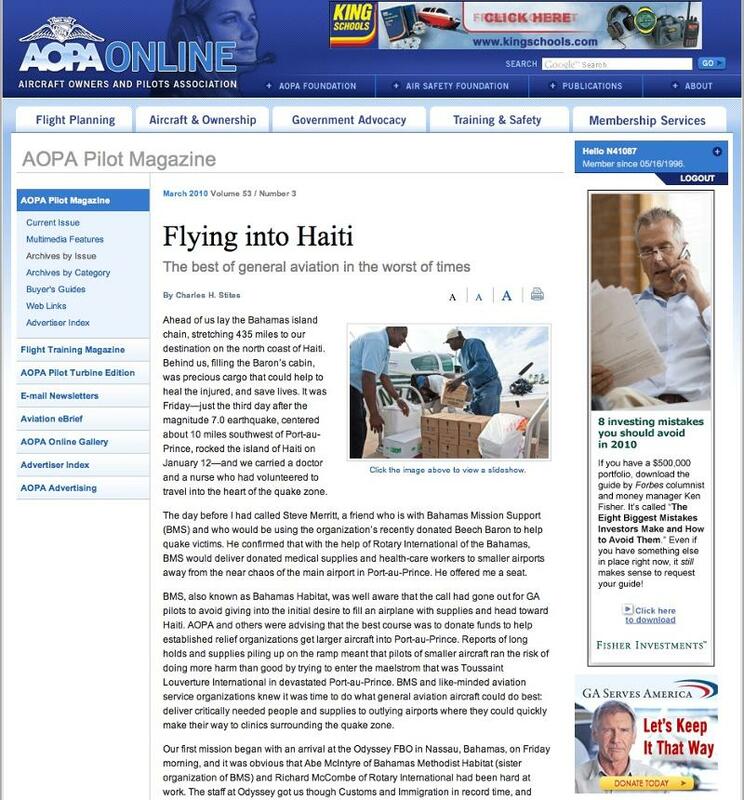 The devastating earthquake that struck Haiti on 12 January, 2010 was another call to arms for volunteer pilots and the general aviation community. Like so many disasters and emergencies before, aviators quickly responded with great resolve to help those in need. I was fortunate to have an opportunity to witness first-hand the tremendous response made by volunteer pilots and the significant impact that general aviation had on a devastated country and its people. 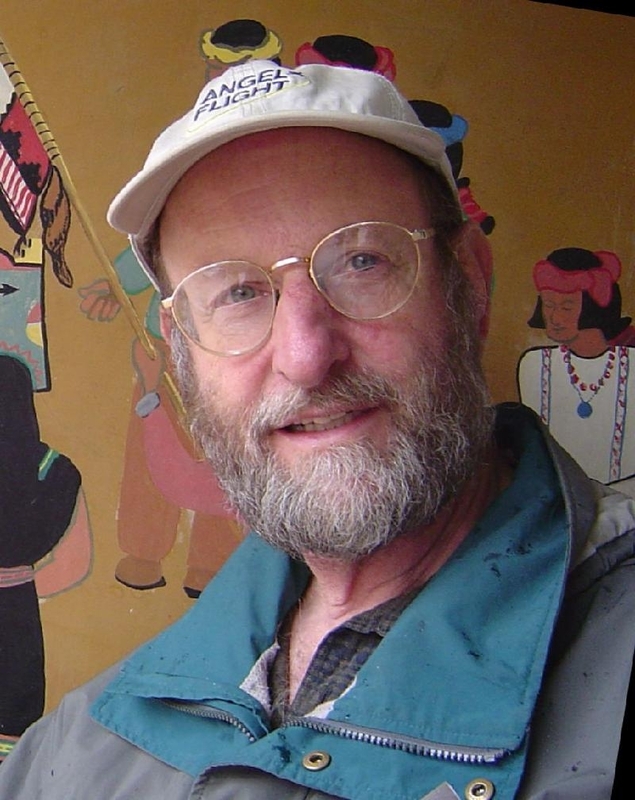 When my lifelong friend, Marc Williams of Seattle, emailed me this curt question: "Want to go to Haiti?" I quickly looked at my calendar for the next week and made the decision to go. We would meet at his in-laws in Florida on the 29th of January and head down to Ft. Lauderdale. Marc had serendipitously met Steve Merritt of Bahamas Habitat (www.bahamashabitat.org) at an FBO in North Carolina the day before. 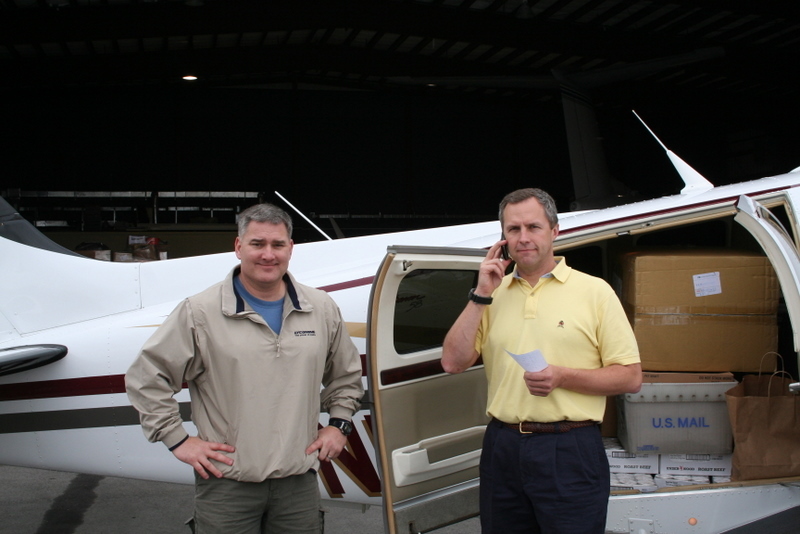 Steve convinced Marc of the great need for small planes and pilots to help out and gave Marc the points of contact for their crew in Ft. Lauderdale. That was all the incentive Marc needed to put his new-to-him Baron to good use. On Sunday the 31st we made our first trip from Ft. Lauderdale to Haiti. By Divine intervention we ended up in Santiago, Dominican Republic (MDST) for fuel and to stay the night. It was there we connected with Ken George of G.O Ministries (www.go-ministries.org and www.gohelphaiti.org). Ken was running such an efficient operation we decided to spend the rest of the week doing as many short hops (1.0 to 1.5 hrs) from Santiago to various outlying fields in Haiti as we could. We carried food, water, dental supplies, medical supplies, diapers and baby formula, rice, beans, cooking oil, tents and other daily necessities from the warehouse in Santiago into places such as Jacmel (MTJA), Jeremie (MTJE) and Los Cayes (MTCA). We were certainly not alone in this effort and that is the real story. On any given day, we had at least 10 GA airplanes of various types "flying the hump" over Pico Duarte into Haiti. There were PC-12s, King Airs, Cessna 402s, 206s, 182s and a 175. There was a Baron, a Caravan and a Twin Commanche, two MU-2s and others that flew in and out during the short time we were there. 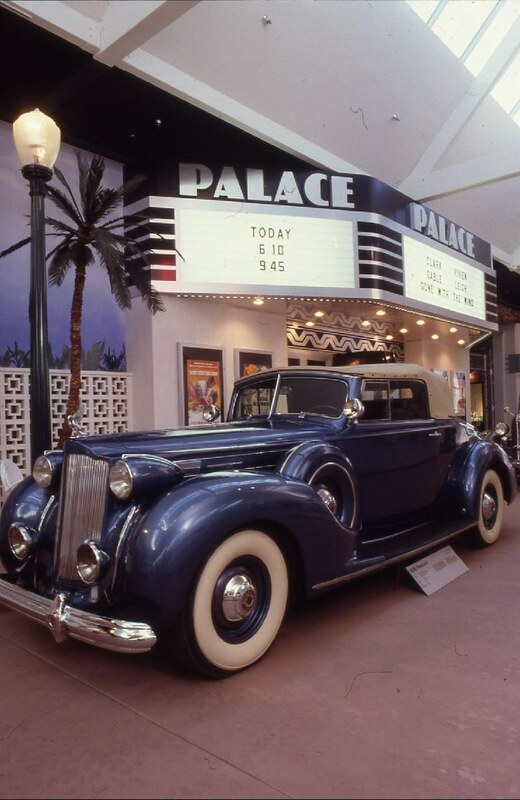 In addition to those flying in country, there were numerous Citations, Challengers, and Lears coordinated by groups like CARE (Corporate Aircraft Responding in Emergencies) that were ferrying goods and people back and forth to the United States. We became an ad-hoc air force with new pilots and aircraft joining in daily and we all enjoyed the camaraderie and the satisfaction of knowing we were making a difference. With the smaller airplanes bringing relief to the outlying towns and villages, we were able to help those who otherwise would have had to wait days or weeks for relief to arrive overland. 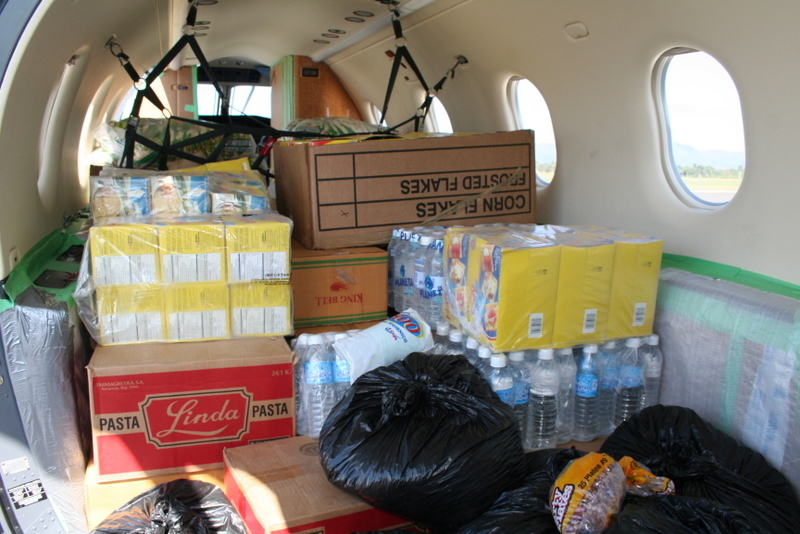 The need was so great in Port Au Prince that getting relief to the other parts of the country was being carried out almost entirely by GA aircraft. Some of the aircraft were there at the generosity of a corporate entity but most of the people and airplanes were private citizens just like you who had paid their own expenses to get there and just wanted to help out. Once again, the overwhelming generosity of volunteer pilots and the incredible utility of general aviation shone through. I would hope that we will never see another devastating earthquake like the one in Haiti, but history says that we will. Until the next disaster, the Air Care Alliance will continue to work with you and your groups to help improve our responsiveness and capability in these situations. We must be tireless in our efforts to develop procedures and communications that will allow us to be effective when called. Thank you all for continuing to answer the call. Make sure to see Lindy's Haitian Pictorial further below in this newsletter. Incoming Arrival! Don't Miss This Flight! Do not miss this opportunity to share knowledge and build relationships with industry professionals and your peers across the country. Leaders, staff members and supporters of public benefit flying are invited to attend and learn more about the relevant, critical issues facing our organizations. HURRY and BOOK NOW! 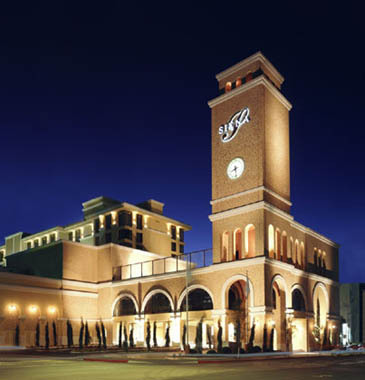 Your reduced hotel rate of just $69-$89 per night is only good through March 31, 2010! You must mention Air Care Alliance to book a room in the block. Click here for full itinerary and conference registration details. Morning Lake Tahoe luncheon cruise*, welcome reception, dinner and President's Suite reception. Saturday, April 17th - What a Full Day! Disaster Response - "Haiti, Katrina & Beyond"
Including Selena Shilad of the Alliance for Aviation Across America, who will speak about the importance of General Aviation in providing medical and other services to our communities. All this for just $75 per attendee! *Friday Lake Tahoe luncheon cruise and Saturday evening banquet have additional fees. The following is a reprint from an article written by Charles Stites, published in the AOPA Pilot Magazine - February 25, 2010. Ahead of us lay the Bahamas island chain, stretching 435 miles to our destination on the north coast of Haiti. Behind us, filling the Baron's cabin, was precious cargo that could help to heal the injured, and save lives. It was Friday-just the third day after the magnitude 7.0 earthquake, centered about 10 miles southwest of Port-au-Prince, rocked the island of Haiti on January 12-and we carried a doctor and a nurse who had volunteered to travel into the heart of the quake zone. 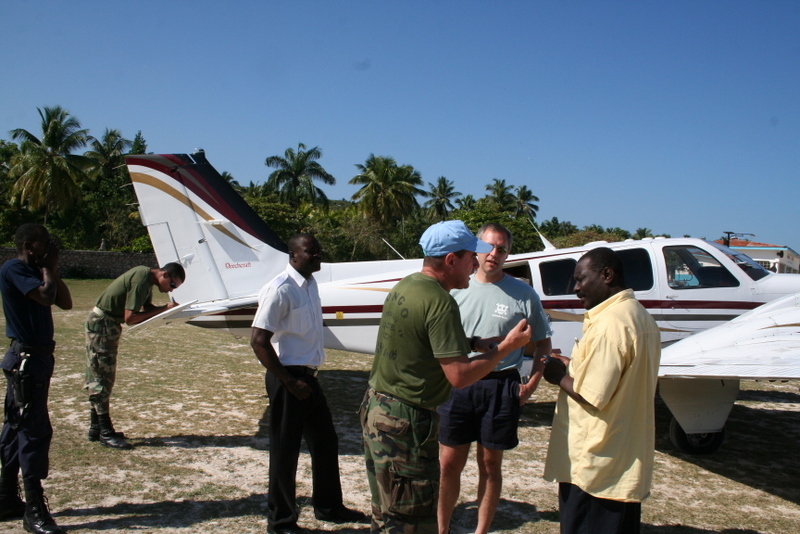 The day before, I had called Steve Merritt, a friend who is with Bahamas Mission Support (BMS) and who would be using the organization's recently donated Beech Baron to help quake victims. He confirmed that with the help of Rotary International of the Bahamas, BMS would deliver donated medical supplies and health-care workers to smaller airports away from the near chaos of the main airport in Port-au-Prince. He offered me a seat. Please feel free to forward this newsletter or the link http://www.aircareall.org/ff-090510.htm to other members of your group and to anyone else interested in public benefit flying.